The first international released album "Love and Death" of Ebo Taylor has been released in October 2010. The 74 year old Ebo Tylor is one of the legendary musicians from Ghana. With Fela Kuti, Tony Allen and Mulatu Astatke, he founded the afrobeat. Ebo Taylor has met the band Afrobeat Academie from Berlin in Ghana. After some joint concerts in Paris, Berlin und Köln, they were together in teh studio and recorded the album "Love and Death" by Ebo Taylor for Strut Records. Afrobeat Academy is a multinational group resided in Berlin. It has been founded in 2005 with members from Ghana, Amerika, Canada and Germany. 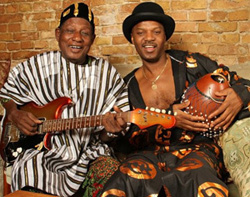 The band played für the Nigerian guitar legend Oghene Kologbo and for Bantu in 2005 to 2009.